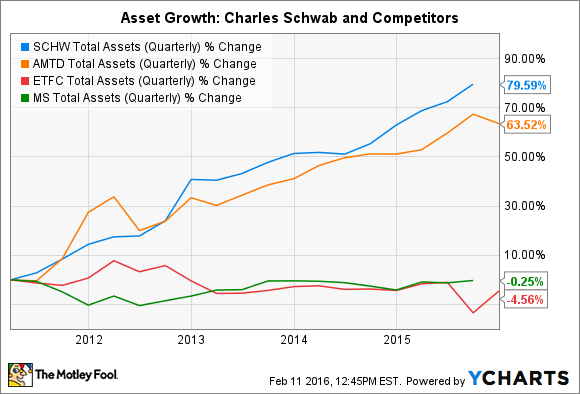 Everything you need to know about the Charles Schwab Company in one bit-sized chunk. Over the next five minutes, you'll learn the essential knowledge necessary to understand exactly what makes the Charles Schwab Company (NYSE:SCHW) company tick. Let's dive right in. What does Schwab actually do? Charles Schwab's business breaks down into three primary revenue streams. First and most important are the fees earned from the bank's massive portfolio of managed client assets. This includes mutual funds, ETFs, and other investment vehicles totaling over $2.5 trillion at year end. In the fourth quarter, Schwab brought in $673 million in revenue from this business, a 5% increase year over year. Over the next few years, this business should be a major driver of earnings growth for the company as rising interest rates could wring out even more revenue from the $2.5 trillion in total client assets. We'll explore the company's growth potential in more detail later in this analysis. Schwab also has a robust lending business, driven by significant portfolios of margin loans to its investing clients as well as debt securities that provide interest income. The revenue from these loans are offset by the interest expense paid on the deposits and liabilities used to fund these investments, much like a traditional bank's net interest margin. Schwab generated $690 million in fourth quarter net revenue from its lending business, an 18% increase over the 2014 fourth quarter. The third significant revenue stream is trading revenue from the company's brokerage services. Revenue for this business was $208 million in the fourth quarter, a 13% decline from last year's fourth quarter. The rest of Schwab's revenue, about $120 million, comes from various other products and services the company sells to its investing clients. This miscellaneous category varies quite a bit from quarter to quarter, ranging from a low of $63 million in the first quarter of 2015 to the high seen in the fourth quarter over the last five quarter. At core tenant of Schwab's management philosophy is effectively controlling cost, and in this arena the company excels. For example, in 2014 Schwab posted an industry leading ratio of expenses to average client assets. Schwab's 0.17% bested TD Ameritrade's (NASDAQ:AMTD) 0.29%, E*Trade's (NASDAQ:ETFC) 0.41%, and Morgan Stanley's (NYSE:MS) wealth management division's 0.60%. In a period of low interest rates like the company is contending with today, expense management becomes even more important. From 2008 to 2015, the company increased total client assets from $1.1 trillion to over $2.5 trillion. That's remarkable growth, however, because of the low interest rate environment over that time, Schwab's revenue has not been reflective of the full potential of those assets. Industry leading expense management have been critical to maintaining strong profitability during this time. Specifically in the bank's huge money market fund business, low interest rates have handicapped revenue significantly. When the Fed lowered rates to near-zero, money market rates declined along with the broader market changes. If Schwab and others continued charging their standard fees for these accounts, it would have pushed investor yields below zero. Instead of putting their client's investments into the red, Schwab elected to waive some of those fees to keep returns above zero. In 2015 Schwab waived $672 million in these fees alone. 2014 was even worse with $751 million waived. As rates rise, Schwab and money market players will be able to avoid these fee waivers and quickly unlock the true earnings potential of its huge portfolio of client assets. Because the company must still spend all the money required to operate the funds today, the increase in revenues should have a very direct impact on net income. Adding back the full $672 million in fee waivers to 2015's $2.65 billion in total asset management fee income would immediately increase revenue by over 25%. At the same time, higher rates should also increase the company's revenue and net income from its lending business, as it will be able to charge higher interest rates without an equal increase in its funding costs. The market recognizes these possibilities and as a result has valued the company at very high price to earnings multiples over the past few years. 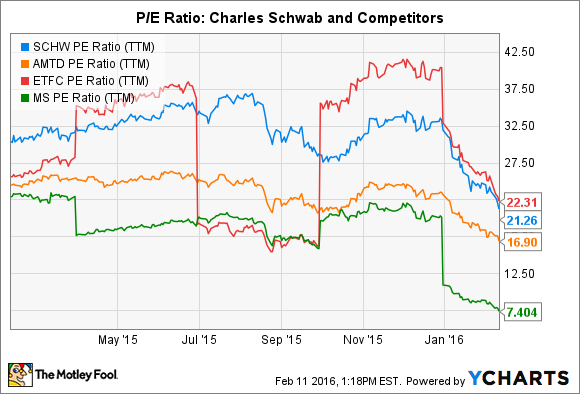 Among its competitors here, only the online specialist E*Trade's P/E ratio comes close to Schwab's. For long term investors, Schwab is a high quality company with lots to offer. It's a proven high growth stock with even more earnings potential looming as interest rates rise. In the meantime, the company's efficiency and operational excellence ensures profitability and the best possible shareholder returns regardless of the interest rate environment.